Ridgely! During Swami Vivekananda’s first and second visits to America he spent in all at least twelve weeks of rest and revitalization at that beautiful estate, speaking day and night of God and of things of the Spirit, transporting those around him. Now Ridgely is open to spiritual seekers from all over America, indeed from all over the world, as a retreat center. 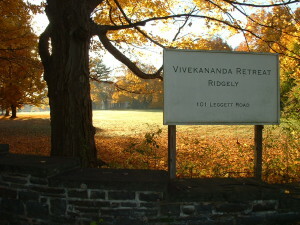 The Vivekananda Retreat provides a unique opportunity for aspirants to integrate and intensify their spiritual practice in an environment that is surcharged with Swamiji’s spiritual power. The Retreat is under the spiritual leadership of Swami Swahananda, who was initiated by Swami Vijnanananda, a direct disciple of Sri Ramakrishna. Retreatants, guided by the minister-in-residence, Pravrajika Gitaprana, will attend scheduled classes, practice meditation, and absorb the serenity that is Ridgely.